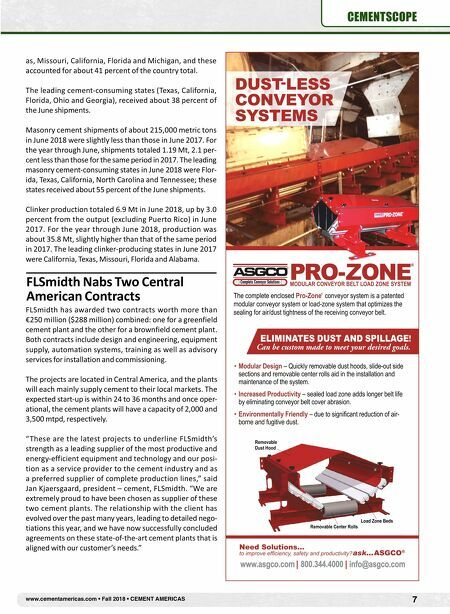 6 CEMENT AMERICAS • Fall 2018 • www.cementamericas.com CEMENTSCOPE Cement Shipments Plateau in June Total shipments of portland and blended cement in the United States and Puerto Rico in June 2018 were about 9.3 million metric tons (Mt), essentially unchanged from ship- ments in June 2017, according to the most recent USGS Mineral Industry Survey. Shipments for the year through June totaled about 45.9 Mt, up by 2.8 percent from those for the same period in 2017. The leading producing states for portland and blended cement in June 2018 were Tex- HeidelbergCement 's group revenue rose by 4 percent in the second quarter to €4.8 billion ($5.6 billion). Nega- tive currency effects of €226 million ($264 million) had an adverse impact on revenue. Adjusted for currency and consolidation effects, revenue increased by 9 percent due to sales volume growth in all business lines and successful price increases. Negative currency effects also affected operating profit: Result from current operations before depreciation and amortization decreased by 3 percent to €936 million ($1.09 billion); after depreciation and amortization, the result from current operations fell to €663 million ($774 million). Adjusted for currency and consolidation effects, result from current operations before and after depreciation increased by 3 percent and 5 percent, respectively. A relatively lower energy cost level in the same quarter of the previous year and further increases in coal and oil prices in the current year slowed down earnings growth. "The solid development of results in the second quarter indicates a positive trend reversal after a weather-related difficult start of the year," said Dr. Bernd Scheifele, chair- man of the managing board. "The growth of revenue and sales volumes in all business lines reflects the strong market dynamics. All in all, we could significantly improve the profit also in the second quarter. The strong operational develop- ment, lower restructuring charges and a further reduction in financing costs more than compensated for the increas- ing cost inflation and negative exchange rate effects. We expect the business development to further improve in the second half of the year and confirm our outlook for 2018." In the second quarter, cement and clinker sales volumes rose by 3 percent to 33.7 million metric tons (previous year: 32.6 million). Adjusted for the disposal of the white cement business in the United States, the deconsolida- tion of Georgia and the acquisition of Cementir Italia, the growth rate amounted to 4 percent and all group areas contributed to this increase. 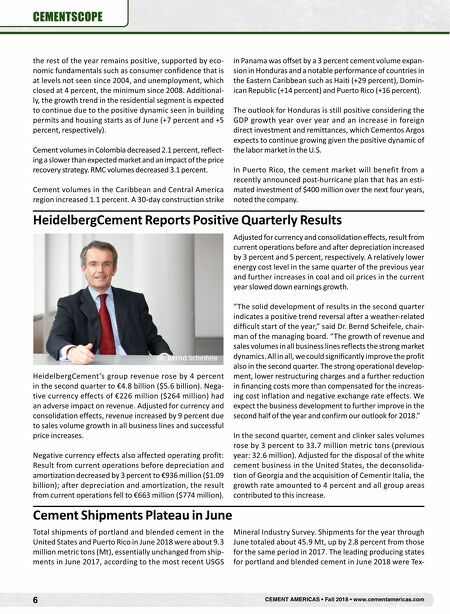 HeidelbergCement Reports Positive Quarterly Results Dr. Bernd Scheifele the rest of the year remains positive, supported by eco- nomic fundamentals such as consumer confidence that is at levels not seen since 2004, and unemployment, which closed at 4 percent, the minimum since 2008. Additional- ly, the growth trend in the residential segment is expected to continue due to the positive dynamic seen in building permits and housing starts as of June (+7 percent and +5 percent, respectively). Cement volumes in Colombia decreased 2.1 percent, reflect- ing a slower than expected market and an impact of the price recovery strategy. RMC volumes decreased 3.1 percent. Cement volumes in the Caribbean and Central America region increased 1.1 percent. A 30-day construction strike in Panama was offset by a 3 percent cement volume expan- sion in Honduras and a notable performance of countries in the Eastern Caribbean such as Haiti (+29 percent), Domin- ican Republic (+14 percent) and Puerto Rico (+16 percent). The outlook for Honduras is still positive considering the GDP growth year over year and an increase in foreign direct investment and remittances, which Cementos Argos expects to continue growing given the positive dynamic of the labor market in the U.S. In Puerto Rico, the cement market will benefit from a recently announced post-hurricane plan that has an esti- mated investment of $400 million over the next four years, noted the company.